Linux and Windows are the two most common and readily available operating systems, and there are many good reasons for using both. 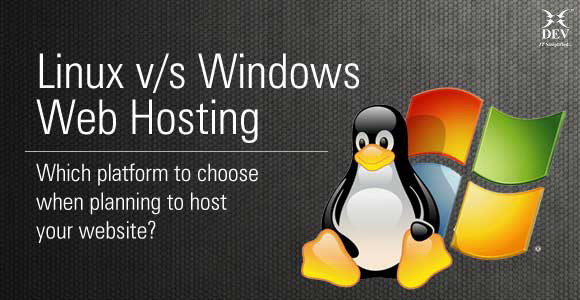 So when comparing between Linux vs Windows web hosting, what should one choose? Before we begin, let me clear a few misconceptions. Just because you use a Windows desktop PC doesn’t mean you have to opt for Windows Web Hosting (and the reverse is true as well). What is important is that you should know what you want to have for hosting your website. The choice of operating system for hosting primarily depends on what kind of development language or database you might use for your website. This is what will ultimately help determine what will work best for you. In deciding which OS is better for your website, it is important to know the differences between the two, as well as their relative benefits and limitations. Windows web hosting is a good option for people who are familiar with Microsoft technologies, as this is a Microsoft product and easily integrates with other Microsoft products. The main reason for its popularity is that it has a lot of support from the vendor. Linux Web Hosting is even more widespread than Windows today. The main reason for its popularity is that it is affordable. As a result, a majority of new businesses opt for Linux hosting in order to minimize start-up costs. It’s typically found to be the most reliable, stable, robust and efficient system. A web site housed on a Linux operating system will have very high up-time (of the order of 99.9%). It allows users to easily set permissions and password-protect directories. Although many people consider Linux to be more secure than Windows, both operating systems are equally secure. Security really depends more upon the server setup and the administrators managing the server – regardless of OS. Factors such as power supply, server admin skills and network load etc. also matter when it comes to maintaining the system uptime. High. Windows technologies are licensed, which drives up costs. Low. Linux can be freely distributed and downloaded. There are priced versions for Linux also, but they are normally cheaper than Windows. So when comparing Linux vs Windows web hosting, we can say without any specific preface or context that this really is an apples vs oranges comparison. Frankly speaking, there is nothing better or worse about either Linux or Windows Web Hosting. Both platforms are simply different tools for different scenarios. Oh dear, so much information missing here from just about every section. Let me just name a few. There are so many that come with windows and Linux as standard, primarily you missed IIS web server for a start, plus all the various modules it supports, which is a core part of the web server. right out of the box windows also supports RDP, WebDav, Network fileshare. There are also other options. So much missing here, you have also implied Windows does not support PHP, which it does, very well. Also Perl, Node.js, Ruby, Java, python, Grails, and many dozens more on both Windows and Linux. again many missed, such as PostgreSQL, Oracle, Firebird, Mongo, CouchDB, and many more on both Windows and Linux. This is simply wrong. The cost to run windows with an equivalent setup to Linux is not high. Many hosts will provide you with Windows Incense for free on a VPS, otherwise you can get it on a low monthly cost using SPLA. Additional cost comes with support if you are not able to manage your own server, this is more likely to be higher with a Linux server if you have no prior knowledge. Custom written apps are the ones which will cause you problems, and this will even be moving between same OS on different hosts, due to hard coded paths and the likes. A PHP site for example which is the most common language, will usually run fine on both Linux and windows, especially the more popular open source apps like WordPress. You are more like to have issues moving a site which was written specifically on Windows to Linux due to case sensitivity in filenames, but any type of cart or CMS which has been written and tested to work on both should run on both. Firstly, thanks for reading the article. Also thanks for your time and effort for your your well-thought out comment. I really appreciate that. You have raised good points that clearly have something to say. These definitely help in contributing to the differences of Windows and Linux Hosting. Through my article, I have tried to touch on only the basic differences which one should primarily consider before choosing the right alternative for hosting. Great job…very nice content. I think it would be very helpful to all. Thanks for reading the article and your comment. I really appreciate that.